"The gentleman who came to my house was the best of the..."
"Our clogged pipe was cleared quickly and inexpensively. The..."
This Morristown customer was worried about a popping water heater. This was caused by hard water. To prevent its failure and resultant leaking, Pipe Works was there to replace with a new Rheem water heater. A customer in Morristown was complaining about the quality of their water. It was too hard and didn't taste very good. Their old water softener required adding salt and was past its usefulness. Pipe Works Services replaced the old system with a new no maintenance Halo 5 whole house water conditioner. This creates better tasting, safe to fixtures, salt free conditioned water. In our area, hard water is prevalent. The damage this water does to fixtures and appliances is plentiful. To eliminate more potential for damage and in fact, reverse the damage already done, the Halo 5 water conditioner is a customer pleasing option. This salt free, no maintenance conditioner creates great tasting water, on par with bottled water! I would like to get an estimate for a furnace replacement and A/C install. The house has a furnace and duct work already in place so the full scope would include removal of old furnace, install of new furnace and A/C install. I have a draft that causes my bathroom waterline to freeze. I know where in your the basement it's coming in but just can't seem to seal it. There is a crawl space under my kitchen that is not insulated and causes the kitchen to be difficult to heat. Your company made a call at our home as a result of a GE warrantee problem. Your man was most courteous. Have been using them for years- great service and highly skilled technicians. Pipe Works Services, Inc. is committed to customer service and is proud to serve our area. We have a certified team of technicians that are ready to help you find the best solution using quality products from the best manufacturers in the business. We want to work with you so that you can have the best results for your home! Homes that are in a constant battle to stay at a comfortable temperature usually suffer from one or both of two things: poor insulation and just general disrepair. Heating and cooling systems can fall into disrepair if they are not serviced regularly. Don't let your home be caught in a crisis when you really need your heating or cooling system the most and call Pipe Works Services, Inc. today to get an inspection! Your home's energy efficiency is often linked to how well your home is insulated. Air can leak through cracks and gaps in your house's floors and ceilings, causing your heating and cooling systems to work more than they need to in order to keep your home at a comfortable temperature. 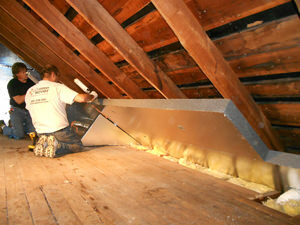 By insulating your attic and crawl space, you can easily cut down on energy costs. When air leaks from an attic in the winter time, it forces the crawl space to take in cold air from the outside in order to replace the air that was lost. The cold air then gets circulated through the house, causing your home's HVAC system to work overtime. Our SuperAttic insulation system uses both spray foam and SilverGlo rigid insulation to seal up cracks and gaps so that you can maintain the temperature you want. Want to find out more about how you can make your home more energy-efficient? We offer expert energy audits from our technicians who can walk you through all your options. You can improve the indoor air quality of your home to make it a healthier, more comfortable place, and our energy audits can help us figure out what the best solution for your home would be. Pipe Works Services, Inc. is proud to serve our area and we pride ourselves on our customer service. Our friendly, knowledgeable staff and certified technicians are ready to help you find a solution for all your insulation, HVAC, plumbing, and electrical needs. Call us today for a free estimate! Pipe Works Services, Inc. has been Morristown, New Jersey's expert electrician since 2000, providing both interior and exterior electric services, complete home addition wiring, emergency electricity repair, and more. To see if your electricity is as energy-efficient as possible, click below or call 1-844-884-5409 to schedule a free, no-obligation estimate today! Exhaust and intake venting for boiler. Saw cut a section of the paneling on the rear over hang below the bathroom to expose all plumbing the bathroom above. -Open up the garage ceiling to expose the plumbing pipes that run from the basement to the bathroom. -Encapsulate all water and waste lines with 2 inch silver glo and 2 part spray foam. -Patch the garage ceiling with drywall and 1 coat of joint compound. -Re-install the wood paneling on the rear over hang. Seal all seams with stainable wood putty. Add an addition supply duct and register to both the kitchen and tv room. We will connect to the existing truck line and install a register grill in the floor in the kitchen and tv room to supply additional conditioned air. We will also install a sanded piece of plywood with rigid silver glo foam board to fit over the fire place opening in the tv room and seal into place with silicone. Investigate/repair the post on the front porch 6x6 on the left side of the porch. Remove and dispose of existing fiberglass insulation from under floor in crawl space. Air seal and insulate crawl space by installing approximately 2" Closed cell spray foam on exterior walls and rim joist of crawl space. Install 1" TerraBlock insulation matting on floor sealed off with Clean Space vapor barrier. He also installed a single lever washing machine valve in place of Old boiler drains with 1/2" Copper Ball Valve, 3-FT of 4 inch sewer pipe with PVC exposed & replaced frost free hose bibb with vacuum breaker. A new customer in Morristown called Pipe Works Services because this customer was having an issue shutting off the shower faucet. They shut the water to the whole house off. Our technician Mario rebuilt the shower faucet located in the second floor bathroom, then restored the main water to the house and tested shower faucet. Mario restored proper function and also tested the water pressure it was at 50 psi. I have a sump pump in my crawl space that is working fine, but the above ground discharge pipe freezes in the winter. Wanting to reroute it so it goes underground and connects to the nearby storm drain. Less important, but the humidity in my crawl space gets to 70-80% sometimes... so open to suggestions on lowering that. Basement needs rodent proof gap filling and insulation, attic spaces need enhanced insulation. Air Conditioning unit was damaged by a tree and in need of repairs. Would like to receive a quote. Looking to install a water softener system (we have hard water) that is not salt based.